If anybody is interested in just collecting sig items other than coins we could post here. I have traded quite a few of my wooden nickels for other sig items, and thought maybe it should have it's own thread. This way it doesn't clutter the geocoins. I have wooden nickels left if anybody would like to trade, also my kids will be getting their own soon. I have a wooden nicekl I would love to trade for other nickels and sig items. If anyone can please email me your address, I will send mine back and trade items with you. essage sent to you ladycacher. I too have a wooden nickel and a sig card and would love to trade either or both with anyone. I have a colored signature wooden nickel. I can do some trading. Too funny Ladycacher. My coin was specially made from the maker of your coin who is a very good friend of ours !!! He has great prices and is VERY fast at getting them to you. I am going to have him do some for my kids also. I would like to say thank you to all that have traded sig items (including wooden nickels) with me since the posting! ladycacher and pghlooking: Email me your address and my wife will get coins out to you tomarrow morning. I'll reply back with mine. My son's wooden nickel that is on it's way. The coin will be alittle different on the back. I have a few of my star-shaped wooden nickels left. They have a rocking horse and our caching names, year, town and state on them. We have horses and our farm name is Under a Shooting Star Farm. I may do a second edition of the stars if there is interest. Of course, being made by hand, no two are exactly alike, anyway! If anyone else is interested in trading wooden nickels, email me. I have plenty to go around! Here is my nickel if anyone is interested. Thanks to everyone for trading wooden geonickels with me, I'm still willing to trade with anyone else that wants to. Alright I am going to do a mass offer here. I appreciate all those who I have already made trades with, I thank you for the opportunity to acquire you signature items. I would like to make trades with the follwoing people that have already stated they would like to make trades. Please PM me and I will respond to complete the deal. I guess I should state that I have wooden nickels I am looking to trade, I will even sweeten the deal by adding some poker chips. 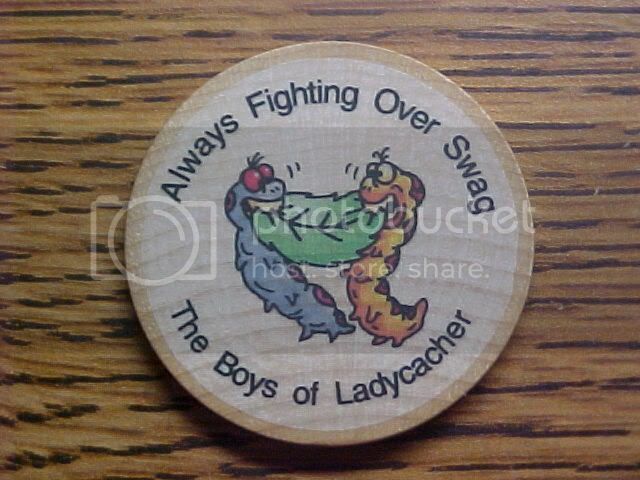 * ladycacher- I know we just completed a trade for your wooden nickels but I sure would like to get my hands on some of the nickels that are being made for the kids when they are completed. Please let me know if we can work something out. * pghlooking- I already have your wooden nickels so I believe we made a trade awhile ago for sig items. And anyone else that would like to make a trade for wooden nickels or any of my other signature items please feel free to drop me a line. Oh for those who are wondering here is a link that will show my signature items http://tinyurl.com/blhuy minus the wooden nickels. I've wanted to collect Wooden Nickles and Sig. Items -- especially those I get directly from the person themselves. Here's my question. 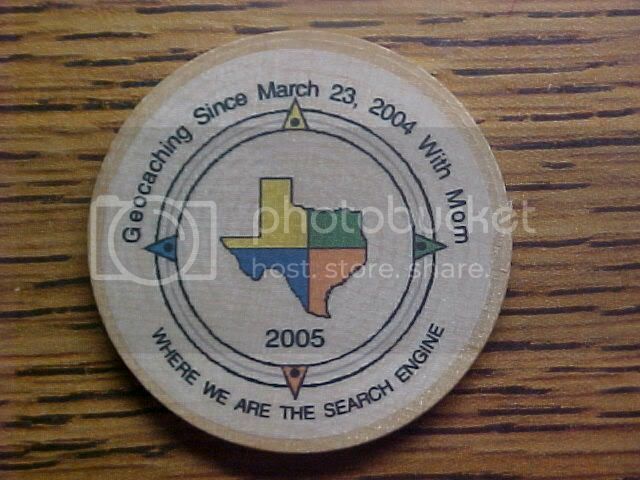 What would a fair trade be if I was to trade a regular geocoin for wooden ones? My coins are coming in at about $8 each -- and while it isn't strictly about the value, I am wondering. Always glad to trade geo-sig items for my plastic MrCOgeo GeoToken (2004). I especially love coin sized sig-items! All offers guaranteed to be at least responded to, eventually! Email is much preferred over PM though! IMO...MRCOGEO plastic tokens are really cool, we traded a while ago. I LOVE Geocoins. I think they are very cool. I'd love to make my own personal geocoins to trade for other personal geocoins....but I just can't swing the initial expense. This is why I'm now getting big into the sig geonickel trades. SO, if you wanted to trade your sig geocoins for geonickels I think you could call the shots on the deal. Personally, I'd probably offer something like 10 geonickels, a handful of sig cards and a couple bucks plus some other local cachers swag to help meet the trade equal value of a geocoin. But that's just my opinion. I would think it would take a lot of wooden nickels to equal a geo-bone!! Prices for nickels are about 35cents, I think. That's 23 nickels for a $8 coin! I'll be robbing caches for months to come up with that trade! If I had bags of money -- I'd trade even. It's not *really* the money issue as much as the idea that the coin represents someone else that is obsessed with the hobby! I think I'll create a wooden coin. Here's ours and I'm willing to trade with anyone. I got one Lightning bug. Picked it up on the way to the WGA picnic!! I have sent emails to Team lightningBugs, MrCOgeo, and Damenace. I am still wanting to trade for *ANY* sig items. I am now addicted to sig items, they can say so much about a person! I just wanted to share the way that I've been shipping out my wooden nickel trades. I bought small ziploc style bags at Wal*Mart, they are 1 3/4" x 1 3/4" and you can get a hundred or so for a couple bucks in the craft dept. I put the nickels in those then tape the 2 nickels side by side to an index card, place another index card over that and slide the whole thing into a standard small envelope. Postage: whether I've sent 2, 3 or 4 nickels they all meet the weight for standard 37 cent postage. BUT...since they can't be run thru the machine at the post office, you need to add 12 cents worth of stamps to each envelope for hand sorting. Also, if you go to the post office to drop them off they want the envelopes handed right to a postal worker instead of put in the regualr mail slot. I've been a little slow sending my nickels out to all that requested them. Vacation kind of got in the way and when I'm on vacation, I don't rush for noone! I'll get them out asap, since I'm back to work today. I have some wooden nickels as well. I will try to get emails to everyone, but I am willing to trade for all of the above items. Mine are numbered, so if you want a specific number, let me know (up to 1000). Right now, the only ones that are not available are 1, 360, 490-500.
sorry folks, gotta make a bump, topic fell onto the 2nd page. Any other cachers out there wanna make trades for wooden geonickels ?? I've gotten some great trades with all the cachers listed here so far and am looking for more....as I'm sure they are as well. Right Wing Wacko, Mustcache, and IJump...I haven't herd back from y'all, so I didn't know if you had recieved my email. Well, I sent out the nickels to all that sent me their addresses. They went out on Tuesday. If you haven't received them, let me know. I love to trade nickels....anyone who hasn't traded with me yet, shoot me an e-mail... I have pix on my profile page. Unfortunately, I don't have a wooden nickel of my own yet, but if anyone is interested in cards or other items I would love to trade for your items. Whatever they may be. Here is a pic of my current laminated sig cards and my nameplate (made from polymer clay). If anyone is interested please feel free to e-mail me. Ladycacher thanks for your e-mail. I look forward to a trade. Plenty more if anyone is interested. I still have lot s of my wooden nickels left for trade for all that I havent traded with yet. You can see all my coin listed at the link below my signature. Anyone else interested in wooden nickels, I have a whole bunch of duplicate trades and also My own wooden nickel to offer for trades. See my coin list at the bottom of page by signature. Ladycacher, I received your items yesterday. Very nice. You should be receiving a package with my items soon. I found a few remaining homemade wooden nickels I made for a local CITO event, so I threw one of them in also. Damenace your package is also on the way. Thanks to all who have traded. Plenty left to trade for *ANY* sig items. I have a goofy looking wooden nickel that I would trade to those that would be interested. Would welcome all types of geo-tokens. Several, I have already swapped with, Thanks! 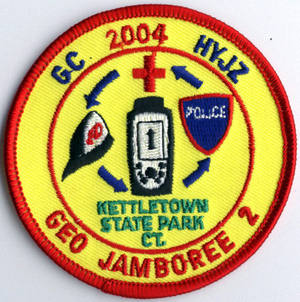 I have an extra patch from the Geo Jamboree 2 event that was held in CT if anyone wants to trade. I'd prefer to trade for another geo patch or some other cool sig item. 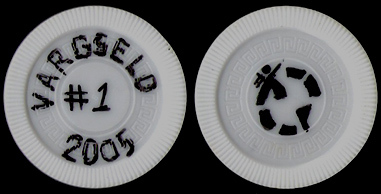 I also made up some real quick poker chips of my own. I just drew everything on them. They're not fancy in the least bit! I made them to leave in caches, but if anyone just has to have one let me know. My wooden nickels just arrived today. Let's trade! 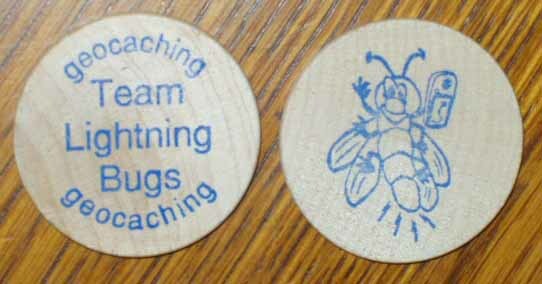 I recently ran across the last half dozen or so of these wooden nickels I created for a local CITO event back in May. They are avaliable for trade along with my other sig items mentioned earlier if anyone is interested. I was wanting to have patches made as a sig item, anybody know where to go for that? The positive response I've received from my CITO nickel has motivated me to finish the design of my standard nickel. This nickel is now avaliable for trade along with the other items shown in my eariler posts. Thanks to everyone with whom I have been able to trade and I look forward to more. Who does everyone use to make wooden nickels? There are several places. Here is where I got my wooden nickels. I'll trade my own SilverMarc Wooden Nickels for others. I keep one, but put the rest into caches whenever I can, so they'll get around! there is alot of coins, such as mine and ladycacher and her kids coins made by M&M Hunter. You can look him up at his profile to email hime for quote through the profile page. He is very competive on pricing.His coins are full color on both sides and are very great quality. I very much recommend him highly, as Ive reordered from him 4 times now.